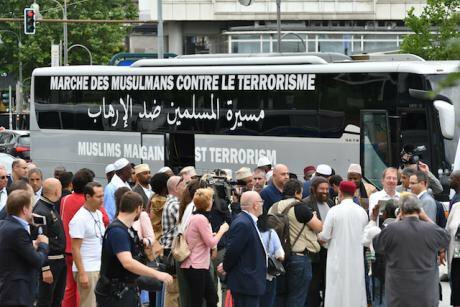 This initiative started by French Imam Chalghoumi and Jewish writer Halter toured Europe in July, 2017. According to one IPSOS Survey, the perception in France is that 31% of the population is Muslim.The true figure is 7.5 %. Paul Zinken/Press Association. All right reserved. Often, one of the gravest threats to an open and transparent democracy is that political decision-makers act not according to the reality of the facts, but according to how people interpret that reality. It might be argued that how people imagine the world has now become more important than how the world actually is, and that politics is frequently little better than an exercise in crowd-pleasing. It is not unusual for these representations of reality to be shaped in one way or another by the media or by other major opinion-making outlets, subject to the influence of complex global and local phenomena, and particularly susceptible to political exploitation. As we are well aware, the most visible and attention-grabbing news items on the web are not necessarily based on sound data that has been properly weighed up and assessed, but are often merely those that happen to be the most widely circulated at a given moment. The phenomenon is encapsulated in the attitudes of Europeans to migration and in the way that the upsurge in the number of refugees has caused instability in many countries. The economic and financial crisis has engendered a sense of public fear that has been further exacerbated by Islamist terrorism, leading many to conclude that integration is too difficult a task. The result has been rising intolerance and new forms of racism. An IPSOS survey called "Perils of Perception" was conducted in 2016 on 30,000 people in 40 countries. Using real data from official sources such as the World Values Survey and the Pew Research Centre for purposes of comparison, IPSOS found that public opinion in all the countries surveyed is prone to serious errors of perception. For example, respondents in most of the 40 countries covered by the survey tended to overestimate the number of Muslims present in their country. In France, the perception is that 31% of the population is Muslim, whereas the true figure is just 7.5%. The same misconceptions obtain in Italy, Germany, Belgium, the United States, Russia and Sweden. Web ‘filter bubbles’ are exacerbating public misperceptions. Search engines guide us towards information that tends to confirm what we already believe or, at the very least, direct us to websites and information sources that chime with our own political profile as we have indelibly delineated it on the web. Researchers therefore need not only to produce more evidence-based facts, but also to present effective comparisons between perceptions and actual data. Facts and figures can and should serve to highlight the gap between popular opinion and reality. The advantages rather than just the disadvantages (in this case of immigration) need to be set out clearly, and a distinction drawn between the short-, medium- and long-term effects of any given phenomenon. While, for example, the arrival of immigrants may well lead to "competition" in the short term for welfare benefits, in the medium and long term, immigration is of vital demographic and economic importance for Europe. A true representation of the "collateral effects" of economic and social decisions is also called for. For the purposes of research and communication, public debate should always be framed in a way that requires participants to make full disclosure of where they acquired their information, so that unreliable sources are not accorded the same credence as trustworthy ones. Web users could be involved in the work of identifying misleading websites and sources of disinformation, and every effort should be made to ensure direct access to sources. Major web platforms such as Facebook, Google, YouTube and Twitter are putting some safeguards in place, but the efficacy of their efforts has yet to be verified. Several newspapers have made tools for assessing the credibility of internet sites available to their readership, such as the Decodex system provided by Le Monde. Meanwhile, journalists and human rights organisations are working hard at developing fact-checking mechanisms that are capable of spotting bogus items, such as manipulated photos and videos disseminated on the internet with the deliberate intention of swaying public opinion (Amnesty International). Several initiatives, some of which will be unveiled at the World Forum for Democracy, aim to improve media literacy, tackle the problem of disinformation and restore the credibility of the media. Some instruments improve the accuracy of web searches by facilitating comparisons between different sources and evaluating their respective credibility. Others create personalised algorithms that enable users to track their sources of information. Even so, algorithms alone will not resolve the problem entirely, because people tend to filter information according to what they already think (the “echo-chamber effect”). A person who has been duped by false information will often have deliberately chosen to be misled because they find the truth less comforting or too complex, or else regard it as nothing other than the expression of an "enemy" ideology. People prefer the seeming speed and efficacy of ideological shortcuts or, simply, are too mentally lazy to do otherwise, because fact checking requires the expenditure of time and effort. Paradoxically, the vast amount of information at our fingertips makes it all the easier to adduce "proofs" of false beliefs. If decision-makers were to engage in serious discussion with researchers and the independent media, they might be more inclined to take account of "uncomfortable" facts and rely less on data that merely confirm their pre-existing political views. In the meantime, the ceaseless hunting for the latest journalistic scoop and the high incidence of aggressive anti-political attacks, which are especially common on social media, serve only to discredit politicians indiscriminately and stoke popular scepticism and cynicism. Unfortunately, many populist politicians have a vested interest in exploiting the misperceptions of the public. It is therefore not enough to refer people to clear and scientifically proven evidence. Rather, we first need to overcome the distrust of those at whom the information is targeted. The loss of faith in the traditional media is proceeding apace with an increasing tendency to lend credence to conspiracy theories, according to which the "truth" is always concealed from "the people" by presumptive "hidden powers". At a time of loss of faith in the media and, more generally, in all institutions, news that is entirely fake, tendentious or simply inaccurate spreads easily. Gerald Bronner has shown how what he calls the "revolution of the cognitive market" is favouring the spread of a conspiracy mindset, increasing the speed with which conspiracy theories are taken up on the internet and perpetuating myths. Political populists exploit the sense of grievance of people who feel they are forever being duped by "hidden powers", and cater to their prejudices without ever forcing them to face up to the need for "uncomfortable" decisions. To believe that the solution lies in merely increasing the availability of knowledge is a tempting but misleading way of Enlightenment thinking. Rather, we need to use all the means at our disposal to promote serious debate that grapples with issues rather than simply exciting uninformed speculation around them, that advocates critical and divergent thinking, that inspires discernment and discrimination in the interpretation of information, and that encourages the correct use of sources.